You´re already quite a good cook, but you´d like to improve your repertoire and learn all there is to know about cooking. Or you might be considering turning your hobby into a profession and need a chef who is willing to teach you the tricks of the trade and let you assist so that you can gain experience. Do you aspire to cook at chef level and want to share your experiences with other cooking enthusiasts? If so, this intensive cookery course at Cook Your Life is exactly what you´re looking for. You will have room to experiment and be creative while receiving the personal attention, tips, and pointers you require. Groups will be no larger than 6 people so that everyone gets the attention they deserve. Sign up soon to secure your place. After completing the course, you’ll receive a certificate, all the recipes in a nice a folder and a Cook your Life kitchen towel. The classes are between ± 10 AM and 5 PM. € 950 per person to attend all the classes, €225 per person for 1 day. During the first class, we will prepare several different types of stock and cook a few classic recipes to help you develop your basic skills. We will prepare several courses, paying attention to the plating, and enjoy the fruits of our labor together. After a coffee and a treat, we leave town and head for the countryside. We will get our ingredients at a very special farm with an equally special mission: Supplying the very best products from farmers, horticulturalists, and growers, and invite people to try food with an authentic flavor. The farm has a wide range of its own meat, home-grown, open-field vegetables, wines and cheeses, as well as fresh fish, bread and chocolate made by local producers. It’s a great place to browse and maybe buy some fresh local produce to take home. Once we’re back in the cooking school, you’ll have the chance to be creative and improve your culinary techniques. Day 3 is all about bread, viennoiseries and patisserie. Or in other words, refining your baking skills. We will discuss various types of bread and dough before getting down to a day of baking bread, cakes, tarts, biscuits and luxury rolls. We start the day with a cup of coffee and a chat about the menu, before visiting one of my favorite, traditional butchers in downtown Amsterdam. He will give us a workshop about boning and explain the importance of being able to cut meat efficiently. It will be fun and informative! Back in the cooking school, we will prepare a classic Dutch dish using various techniques, including sous-vide cookery. Dutch cuisine is plentiful in many types of fish, which produce beautiful dishes. The final class will focus on fish and shellfish. Plenty of time to learn and practice new techniques and put them to use to develop your own creative ideas. Two friends and I recently had the great fortune to experience a cooking lesson with Chef Leo. 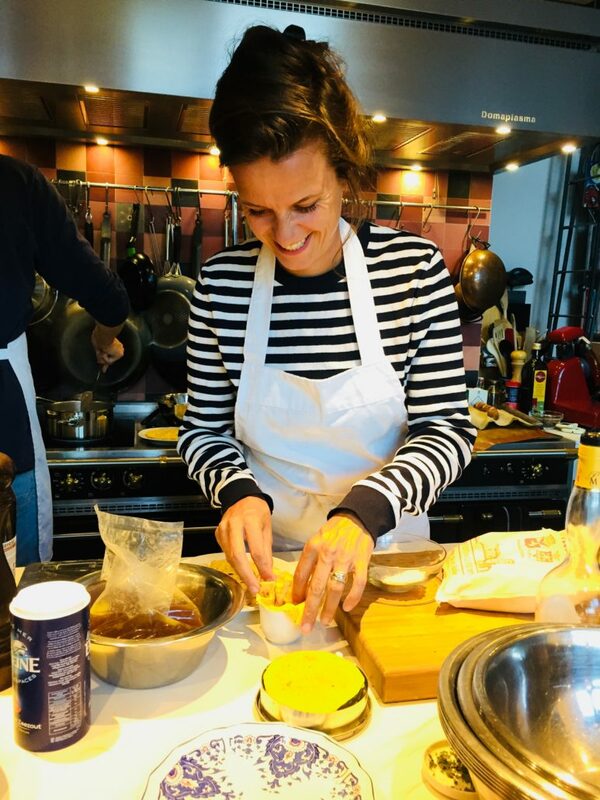 We were visiting Amsterdam and I always like to take a cooking class when I travel. This was by far my best experience. Chef Leo is both welcoming and very knowledgeable and was able to easily accommodate our various levels of experience. Chef Leo introduced us to a new cooking method and Michelin Star recipes that I am now creating in my own kitchen. I highly recommend checking in with him if you’re visiting Amsterdam! Ik heb al meerdere cursussen van Leo gevolgd, en ben super enthousiast. Heel kleinschalig, met daardoor veel aandacht zodat je echt iets leert. Ik ben een ervaren recepten koker, maar leer van Leo meer dan een recept namaken. De sfeer is heel ontspannend, zoals koken hoort te zijn en in het nieuwe atelier is koken helemaal een groot feest. Na afloop gezellig met elkaar alles opeten is altijd een mooi einde. Dus absoluut aan te raden voor iedereen die een kookcursus zoekt om nog beter te leren koken.